This Cottage Has 4 Bedrooms, 2 Full Baths, Lots Of Space For Everyone. Come stay in this 4 bedroom cottage, with 3 double beds & 2 single beds, and two full baths. The 1st floor bath is equipped with a laundry and walk in shower. The second floor bath has tub/shower and has been recently updated. There is a galley kitchen with stove, refrigerator, coffee maker, microwave & blender. The living room offers a pull out sleeper sofa and has French doors leading to the wrap around porch. The porch has wicker seating and a picnic table for your outdoor dining and a gas grill. This cottage features WIFI, Central Air and off street parking for 1 car. Penn Realty, Ltd. is a professional, full time real estate agency that has been providing property management in Mt Gretna and surrounding areas for over 25 years. Our knowledgeable staff will help provide you with a vacation that you will remember for years to come. 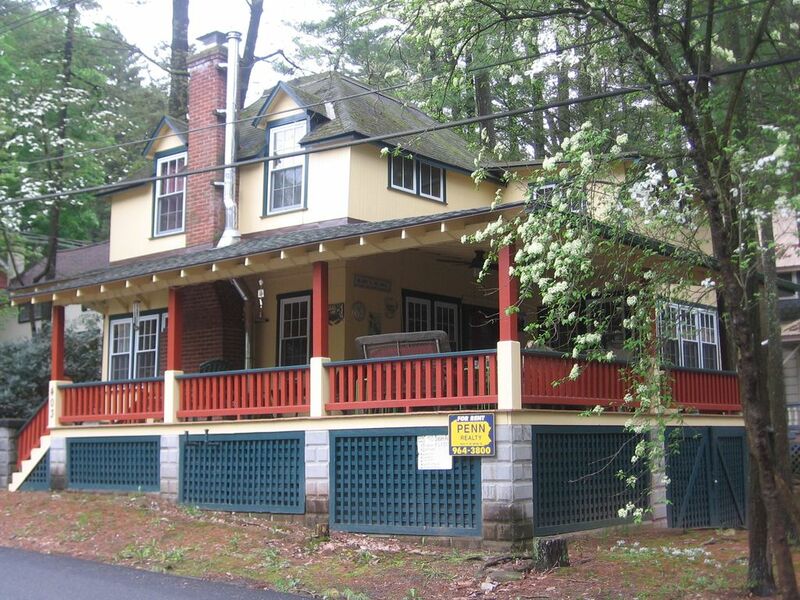 This cottage is located in the Campmeeting section of Mt Gretna and within walking distance to all the summer events. It offers lots of porch area and outdoor entertainment space. Come enjoy all that Mt Gretna has to offer! Mt Gretna playhouse offers theater productions, musical events, and children's theater. The Mt Gretna lake is within walking distance and offers a beach area, play area and canoe rental. Hiking and biking trails are near by, as well is the Rail Trail. Numerous festivals and programs provide entertainment all summer long. Served my perpose well for a ladies weekend. The house itself is very quaint, however, the musty/moldy smell was overwhelming. Driving up to the house, you see a very unique neighborhood. Each house has its own character including this one. There is a great wrap around porch that greets you upon arrival. But once you step into the house, you can smell the musty odor. The upstairs needs to be painted white to lighten it up. One review said it was like camping. It may be like that because you have to provide liners and clean the house before departing. With a few updates and decluttering of the kitchen, this home can be “Bright and cheery”. Over all the place was nice, very camp like. The kitchen was not clean all the dishes are pots were dirty I had to clean them before use. Nice quiet location to enjoy the front porch. I stayed here with 5 friends over one weekend and it was perfect. Check-in/check-out went smoothly and the house was great. Would definitely stay again! During the summer months: Check in is between 1 and 2 PM (Saturday) Check out is 10 AM (Saturday) If you are looking for less than a weekly rental during the summer, please contact our office for availability. Standard rates apply.